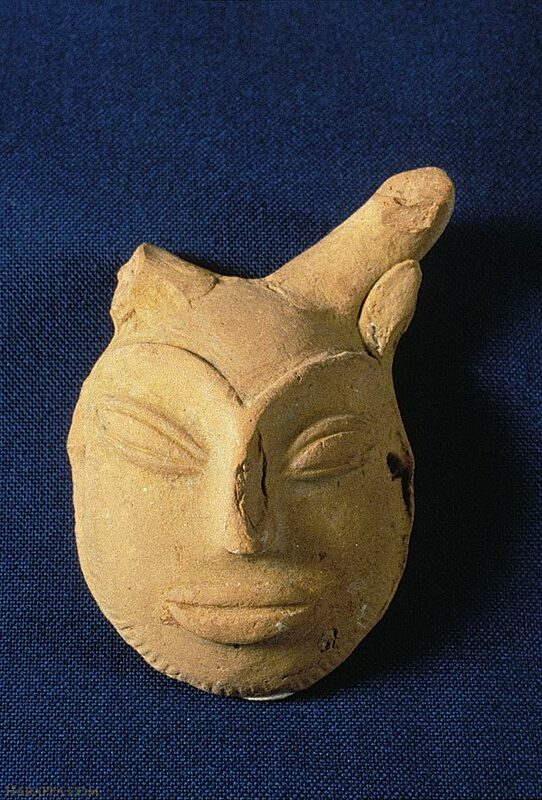 Miniature mask from Mohenjo-daro of bearded horned deity. The face is made from a mold and thumb impressions from pressing the clay are visible on the back. The mouth is somber and the long almond shaped eyes are open. The short horns arch from the top of the forehead and two long ears lay against the horns. This peaceful face can be contrasted to a mask from Harappa which shows a very ferocious face of what may be this very same deity. Two holes on either side allow the mask to be attached to a puppet or worn as an amulet.